Although they will probably never be as efficient nor durable as inorganic or silicon solar cells – you will never see them covering the Nevada desert or the hills of a gigantic solar farm – organic or polymer solar cells still show significant potential. Whether it is providing solar energy to remote microwatt sensor devices, ‘wearable technology’ and handheld electronic devices, their lightweight, portable design and non-toxic, disposable materials make them an attractive option for many novel applications. Read on to find out more. Organic of polymer solar cells (PSCs) make use of organic polymers that absorb sunlight and convert it into electricity – just like silicon-based or inorganic solar cells. While they are not as durable or efficient as the latter, they still demonstrate significant potential as a complementary technology, with research into this emerging technology having expanded rapidly over the last few decades. They could in time come to provide electricity directly to all manner of low-power handheld devices that would otherwise need toxic batteries. For instance, organic solar cells could be used to provide power to freshness sensing device on the packing of foods in the supermarket aisles using nothing more than the lights overhead. They could even be tied into ‘smart shopping’ and ‘smart kitchen’ applications that eliminate waste and automate shopping lists. One major advance of organic solar cells is their flexibility – as they are basically made from plastic, you can place them on and in any sort of material – clothing, backpacks, food – a whole range of point of use applications. The polymers that make up the organic solar cells can also be dissolved using certain solvents and then printed onto flexible backing material using a sort of ‘printing press’. Long rolls of such solar cells could be wrapped around vehicles or even entire buildings and windows. The polymers can be dissolved in solvents and printed onto a flexible backing using affordable roll-to-roll production, making this technology especially attractive. “This printing press is not unlike the one for printing your Sunday newspaper, but instead of three primary colors and black, you’re printing the four or five different layers needed for the solar cell, diodes, and transistors,” Berger said. 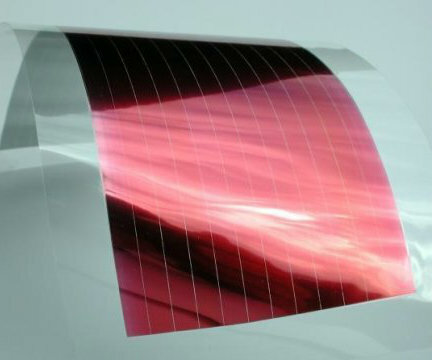 Long rolls of solar cells also open up new applications, such as wrapping vehicles or covering building facades and windows. Here’s another new development in organic solar cell technology. Scientists at the University of Warwick recently built an organic solar cell that generates a voltage high enough to charge a standard lithium-ion battery all by itself, without the need to connect up multiple such cells in series. The cells are also said to perform well in a range of different lighting condition, including partially shaded ones – which makes them ideal for charging your portable digital devices like tablets, cameras and even some cell phones, on the go. Read on as we explore the potential or organic solar cells. The discovery of these organic photovoltaic cells, that operate well individually and under all lighting conditions, was made by scientists at the University of Warwick, collaborating with the solar technology company Molecular Solar. The scientists, who work in the Chemistry Department at the University, demonstrated a solar cell which has an open circuit voltage of more than 7 volts, delivering maximal power at well in excess of the 4.2 volts required to power a conventional lithium-ion battery. It’s the first time such results have been achieved using very high voltage organic solar cells. These organic solar cells belong to the ‘third generation’ of solar technology (so-called), and have exciting potential due to their cheap cost of manufacture, compact and lightweight design, and compatibility with flexible substrates – they are particularly well suited to applications in low-powered, portable electronic devices. This new technology represents a serious advance, as scientists have long been struggling with the problem of the low output voltage of solar PV cells when exposed to less than optimal lighting conditions. This development now means there is a real possibility of rolling out on a commercial scale solar-powered chargers that re-charge your devices as they are being used – even when you are sitting inside on the couch – though due to their lightweight design and portability, they are equally as suitable for outdoor uses. Cheap to make, these tiny solar chargers would be no larger than a bank card, and could easily be fitted to the battery of most low-power electronic devices, including e-book readers, tablets, cameras, and some mobile phones as well. Organic solar cells contain certain raw materials that are very rare and expensive, for example, fullerenes and indium tin oxide, and which may restrict their affordability in the short term. Durability is another issue; the polymers that make up the cells degrade fairly quickly when exposed to oxygen and water. For protection, the cells will need to be encapsulated in some sort of material – that’s easy enough where they are used on a solid surface like glass, but becomes a real challenge on more uneven surfaces like clothing and food packaging. So far as efficiency goes, the best organic solar cells found in the laboratory still only reach around 13 percent, well below the 20 percent rating of commercial standard silicon solar panels. 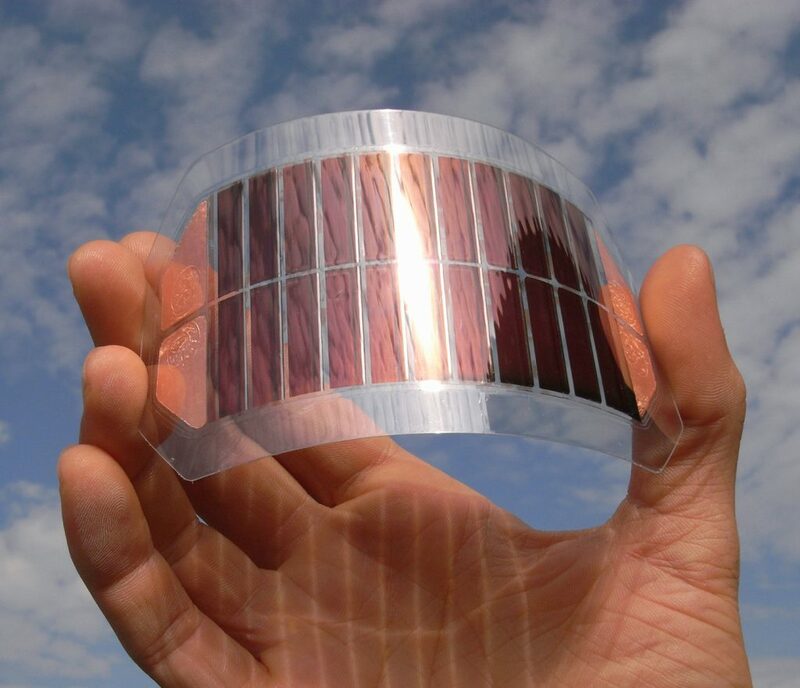 Commercial grade organic solar cells typically only yield about 3.5 percent efficiency. However, with advancements in chemistry and the invention of ‘tandem’ solar cells that stack many layers on top of each other, this figure is expected to improve in the years ahead.